Quick Ship Lockers Lockers Are Assembled to Save YOU time! Courteous Service! The Single Door LOCKER is the most popular and widely used LOCKER & offers maximum space for full hanging of clothing and other belongings. We carry these WholeSale. Each locker has a recessed handle and a convenient shelf for storage of books & small articles. Lockers 18? deep or more come with a coat rod in addition to coat hooks. Accommodates twice as many people as single tier lockers in the same floor space, while still providing enough room for light outer wear and personal belongings. A recessed handle is standard and will not snag a passer-bys clothing! Also known as “box lockers ” for their compact dimensions, multiple tier lockers allow numerous users in the smallest amount of floor space. They are available in 3, 5 and 6 tier configurations. These lockers are ideal for storage of athletic gear or employee personal storage. The 5 and 6 tier box lock is not available with a recessed handle. Locks sold separately. Made in the USA! NOT IMPORTS! 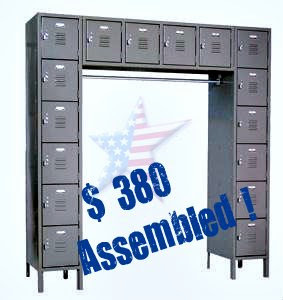 16 PERSON LOCKER Made in the U S A ! 5-6 weeks for designer colors. Ships in 3 cartons per unit assembled. Ships in 3 pieces. Item # Description Price Assem. DESIGNER COLORS ARE 3-4 Week Lead Time ! Lockers Made with Pride in the U S A !